South College is committed to the success of our military students and their families. We understand that it can be challenging to balance family, service, and education. That is why South College offers Military Services to help meet the needs of our military students and their dependents. To access these services, military students can contact the School Certifying Official, located in the Financial Aid Office at each campus. With options for online and on-ground learning, our mission is your success! 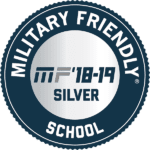 For the 2019-2020 year, South College has been designated as a Military Friendly® institution. 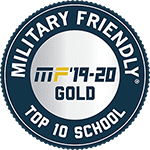 This is a prestigious designation earned by colleges and universities that are committed to the success of military students both in the classroom and after graduation. 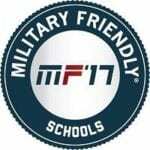 Criteria for consideration can be found at: https://militaryfriendly.com. Our participation in the Yellow Ribbon program at the highest level, our recognition of military training and experience for consideration for academic credit, and our commitment to the Principles of Excellence and the 8 Keys to Veteran Success foster an environment where our military students and their families can thrive and realize their educational and career goals. South College appreciates the service of our military students and their families. We honor that dedication by offering a quality education with services to meet the unique needs of our students. Get the education you deserve and the honor you deserve at South College. Providing guidance in the selection of a program of study. Assisting in the process of ordering transcripts from post-secondary institutions previously attended and completing evaluation of these transcripts for consideration of transfer credit. Aiding in the acquisition of military transcripts for consideration of academic credit. Maximizing the understanding of military benefits for which students may be eligible. 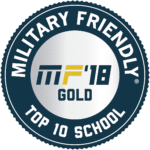 Partnering with students to address military specific issues such as deployment and locating military specific resources available to students. South College honors our veterans and active duty service members by waiving the application fee during the enrollment process. Our military students can also benefit from the Military Student Grant which pays up to $1,000 per term when VA Educational benefits do not fully cover the cost of tuition. For more information about this opportunity, please speak to a member of the South College Financial Aid staff. Maximizing the understanding of military benefits for which spouses and dependents may be eligible. Partnering with students to address military specific issues such as deployment and locating military specific resources available to spouses and dependents. South College honors our military spouses and VA educational benefit eligible dependents by waiving the application fee during the enrollment process. These students can also benefit from the Military Student Grant which pays up to $1,000 per term when VA Educational benefits do not fully cover the cost of tuition. For more information about this opportunity, please speak to a member of the South College Financial Aid staff. South College is dedicated to providing quality education to our military students which includes providing resources that meet the unique needs of this group. Below are some of the Frequently Asked Questions (FAQs) from our military students and the links to the resources that address these topics. How do I know which VA educational benefit I am eligible for? The South College team can assist you in determining what VA educational benefit(s) you are eligible for. We will assist in the completion of the necessary VA applications for educational benefits and will guide you to the appropriate VA office for benefit determination. Military students begin this process in the Financial Aid Office. You can better understand VA educational benefits by visiting the VA website at benefits.va.gov/gibill. How do I know the requirements for Tuition Assistance for my branch of service? Tuition Assistance is approved on a term by term basis and must be approved prior to the start date of each quarter. To find out if you are eligible for Tuition Assistance and for the requirements for eligibility, please reach out to your base’s education service officer. For basic information on the requirements for Tuition Assistance for each branch of service go to military.com/education/money-for-school/tuition-assistance-ta-program-overview.html. How do I know if I have military training that can be transferred in for academic credit? Please submit a copy of your military transcripts to your Student Advisor for consideration of possible academic transfer credits that are applicable to your declared course of study. For veterans of the Air Force, go to airuniversity.af.mil/Academic-Affairs/Registrar to request a copy of your Community College of the Air Force transcript. For veterans from all other branches of service, you can request a copy of your military transcript at jst.doded.mil/official.html. Veterans and active duty service members can access eBenefits online at ebenefits.va.gov/ebenefits/homepage. How do I apply for VA work study? Students who are eligible for VA educational benefits can find out more about VA work study, including who is eligible and how to apply, by visiting the VA website at benefits.va.gov/gibill/workstudy.asp. How can I apply for assistance with tutoring? Many students receiving Post 9/11 GI Bill and Chapter 35 benefits are eligible for tutoring assistance. If you are a Chapter 35 student, please speak directly to your VR&E counselor regarding tutoring assistance. Post 9/11 GI Bill students can visit the VA website to determine eligibility benefits.va.gov/gibill/tutorial_assistance.asp. You can access the application for tutoring assistance (VA form 22-1990t) at vba.va.gov/pubs/forms/vba-22-1990t-are.pdf. When does South College submit my certifications for each term? Initial certifications of enrollment are submitted prior to the beginning of each term. South College notifies the Department of Veterans Affairs through the electronic submission of the 22-1999 form. When does South College report if I drop or add a class? Changes in enrollment status that affect a student’s VA educational benefits are reported as they occur. The number of enrolled credit hours determines the level of benefits the student may receive. South College notifies the Department of Veterans Affairs through the electronic submission of the 22-1999 form. If I am deployed during a term, what will happen to my grades and student account? South College students who voluntarily or who are called to serve in the military prior to the end of the school term for which the tuition was paid are entitled to the refund of all tuition paid for which credit cannot properly be given. Students applying for a refund of any paid tuition must furnish a certificate from the proper military authority reciting the fact of the enlistment, induction, or call into active duty to the military service of the United States. What South College programs are approved for VA educational benefits? All degree and certificate programs at South College have been approved by the VA as eligible for educational benefits. Please contact the South College Financial Aid Department for additional information at 865-251-1800. For more information about the Post-9/11 GI Bill and The Yellow Ribbon Program, visit the U.S. Department of Veterans Affairs website here.